Following on from my post on embracing serendipity, today we went on a fungi foray at Mallydams Wood led by the lovely mum I met in the park in the summer and who's woodland birthday party I have previously posted about. I hadn't been sure about going due to the age of the boys, but last week I finally asked her to book us a place and I'm so glad I did. The last time I went on an organised fungi hunt I was 11. My school friend's family were members of some sort of wildlife organisation and were kind enough to take me along. I have really clear memories of rambling around the misty autumn woods and being spellbound by the huge variety of fungi to be found, including ones that changed colour or were spicy to taste when the guide gave us a little to lick. I don't remember a time when I wasn't crazy about the natural world, so this was one of those perfect days that I held on to in my mind and hoped someday to recreate for my own students or family. It poured down with rain today, but that only added to the fun for the kids who were well wrapped up in their cosy waterproofs. Our guide gave us a little talk on the history of the uses of fungi - fungi were two of the possessions found in a pouch on the preserved body of Otzi the Iceman and are among the oldest organisms on the Earth, vital for creating soil and recycling nutrients. I was expecting to see a handful of edible mushrooms and wasn't sure how we were going to make lunch for the large group from what we found, but the woods were bountiful with all sorts of fungi. Most were inedible or downright deadly, but there were also basketfulls of delicious varieties. Lots and lots of little yellow mushrooms that our guide called yellow trumpets, all sorts of boletes, amethyst deceivers and red blushers went into our baskets and later on into our noodle soup. I was particularly proud of the little cauliflower fungus I found as we were heading back to the education center. 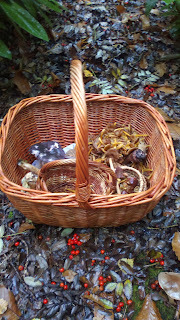 I think several people tried our haul with some trepidation, but we were in safe hands and had a thoroughly yummy and wholesome lunch as a result of our foraging. I have a couple of species now that I would feel confident to pick, but would advise against just picking up a mushroom book and heading out because there were several fungi that were edible that had very similar poisonous versions and without seeing them compared in the flesh I don't think I could have told them apart from the pictures in the books. I would also suggest keeping a close watch on any little people you take with you and making sure you get across the rule of no picking without checking with your expert guide - mostly for safety, but also to prevent damaging species that you aren't going to use. We found that the kids had a fantastic sociable morning clambering around the woods and shouting with excitement every time they spotted a fungus. Ollie also attracted the admiration of a tame Jay that lives in the woods and apparently kept landing on his head - I wish I'd seen and got a photo of that! I don't know that their memories will be as clear of their fungi hunting experience as mine were as an older child experiencing it for the first time, but they certainly had a wonderful time. If you fancy having a go, this is the perfect time of year, with events being organised all over the country by organisations such as the Woodland Trust who have an event at Brede High Woods in East Sussex in early November. Even if you can't get to an organised event where you can safely handle and possibly eat the fungi, you can still have lots of fun going on a camera safari around your local park or woods and seeing how many different types of fungi you can photograph. Little ones might like the extension of drawing, painting or collaging pictures of fungi, and older children can be helped to find out how fungi fit into food chains and classification trees. You may even get hooked enough that foraging your dinner becomes a regular event, as it has for our friends on their small holding in France. If you want some serious lifestyle envy it's worth hopping over to their blog for a look!